The entire saga of India's “milestone in History” or the $42 Aakash Tablet computer, is turning into a big joke. Second version of this computer called Aakash II, was launched by none other than the President of India on 11th November 2012, in New Delhi, at an event celebrating National Education Day. The day marks the 124th anniversary of the birth of Maulana Abul Kalam Azad, who was the first education minister of independent India. This version is powered by a 1 GHz processor, has a 512 RAM and 7 inch capacitative touch screen and Android 4.0 operating system. It would be supplied to students at cost of Rs. 1130/- or $ 21 and is expected to remove many snags and shortcomings of the first version. The 50% subsidy tag would be picked up by the Government of India (read as taxpayers). The first version of Aakash was launched in October 2011, where students were handed several hundred tablets. The device was found to be unsatisfactory by most as it had a resistive touch screen and a battery with a very short life. The Government then handed over the tablet to Indian Institute of Technology, Mumbai, for up gradation, who have now come out with the new design. This tablet was praised by the Government as a milestone in history and would be recognizqable by future generations because it would be Made in India. It was supposed to be a cheap and durable tablet computer for India's Millions of students and a source of national pride for Indians from the country and settled abroad as a proof of India's position as a world leader in cheap innovation. Government of India tender, for manufacture and supply of these tablets, was awarded to one Canadian company, called DataWind, run by Mr. Suneet Singh Tuli, the chief executive. Data Wind had then announced plans to set up factories in India for manufacturing the tablets. VMC Systems, in Secunderabad; confirms the contract but refuses to talk about volume of production. A subcontractor based in Noida, on the outskirts of Delhi says that this is the company’s first-ever contract for manufacturing tablets and has not yet started production. Digital Circuits, in Bangalore, signed an agreement to produce tablets in August but says that they had not produced any tablets for DataWind so far. They also have no experience manufacturing tablets in the past. Vinyas Innovative Technology, from Mysore also confirm having been contracted by DataWind, however refuse to give any further details. It is obvious from New York times report, that this plan of manufacturing the tablet in India is a colossal failure so far. Prof. Deepak Phatak, professor from IIT, who is in charge of this project confirms this and says Datawind’s original subcontractors in India could not deliver the tablets. He added that DataWind had a contractual obligation to deliver the entire batch of 100,000 tablets by Dec. 31. If company fails to meet the obligation, it may face legal action for breach of contract. I.I.T. Mumbai has already sent a warning letter to the company. New York Times also contacted DataWind themselves, who have been giving strange answers to the queries and more or less confirms that manufacturing is not being done in India. Here are some replies from the company. Combined production capacity of the four subcontractors and DataWind’s assembly facility in Amritsar, Punjab, stood at 3,000 units a day. 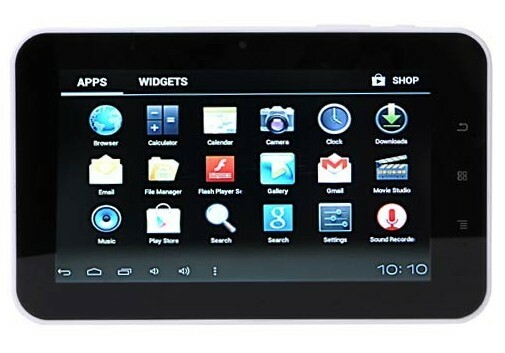 Touch screen of the tablet was being manufactured by DataWind’s facility in Montreal, Canada, and that his company had designed the software, mechanical parts and motherboard. For expediency sake the motherboards and kits are manufactured in company's Chinese subcontractor’s facilities, and kits have been sent to India for assembly. The assembly and programming of the units was done at DataWind’s facility in Amritsar and at a Delhi office, he said Monday. To get the clear overall picture of what is actually happening? New York Times made investigations in China and the replies from Chinese manufacturers reveal the entire game plan of DataWind. Here are the replies received by New York Times from Chinese manufacturers. Kalong Technology, which operates from Hong Kong, says company had manufactured at least 500 A13 tablets for DataWind. And confirms further, that all parts are manufactured in China. Company assemble the tablets and load Android operating system on them. DataWind provided the design for the tablet and added its own software onto the tablets. Dasen International Electronics, based in Shenzhen, says that Datawind had purchased 4,500 tablets from them in three separate batches. The components of the tablets are made and assembled in China, but the design has been worked out by the company with DataWind. As per details found out by NewYork Times, the total number of tablets ordered from the four companies in China, is 11,000, with the price to DataWind ranging from $42 to $42.86 each. It is obvious that DataWind has supplied 10,000 computers from this manufacturing lot to IIT Mumbai before inauguration of the tablet by President of India and there has been no manufacture of this computer in India at all so far. It would be obvious to any one that this computer is being manufactured in China and then DataWind is just distributing it. Government of India might as well just buy the tablet from China directly and give it to students in India. They might save couple of Dollars. Manufacture of Aakash tablet project has become a big joke.